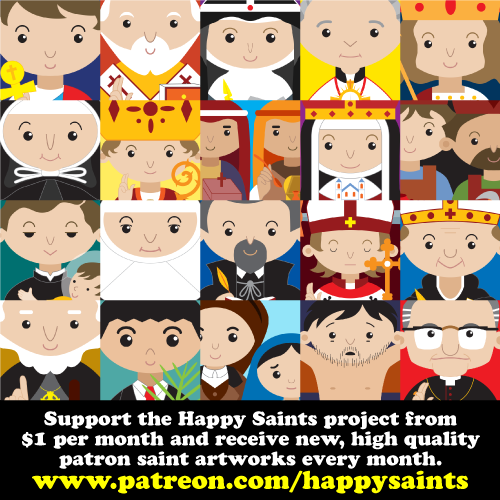 For the last eight years, the Happy Saints project has created over 100 cartoon artworks of Catholic Saints. They have delightfully introduced lives and virtues of holy persons to a generation of children and students. If you would like to help keep the artworks coming, please consider supporting this project as a ‘Patron’. As a Happy Saints Patron, you will receive at least two new artworks every month and other extras, such as high quality printable cards, coloring pages and posters. Signing up as a Patron takes as little as $1 per month. Yet it goes a long way to the production of better New Evangelization resources for our future generation. Thank in advance for your support! God bless you!